You don’t have to look at this ukulele twice to instantly know that it’s a Luna! The brand is renowned for their elaborate designs, and this Dolphin uke – part of their Concert Series – features some stunning high-end detailing that really sets it apart from some of the other models in our sub-$300 ukuleles chart. The biggest question now is, can the rest of the uke live up to its design? As we’ve established, this ukulele sports a distinctive design that’s more than capable of turning a few heads! The uke has an unmistakably aquatic theme, with a translucent azure finish and a trio of beautiful abalone dolphins swimming around the triangular soundhole. The high-gloss trans finish nicely shows off the flamed maple top (giving the added illusion of waves in an ocean), while a standard maple laminate makes up the back and sides. The concert body, with a length of 23”, features attractive 3-ply maple binding for added style and protection. Joining the body at the 14th fret is an easy-playing C-shaped maple neck, which features a rosewood fretboard. This fretboard sports 19 frets that are all relatively easy to get to thanks to the single cutaway, as well as Luna’s familiar mother-of-pearl ‘Moon Phase’ inlays. Maybe it would have been too much to ask to see inlays on the theme of dolphins? That would have really completed the look! Still, we can’t complain – it’s a great-looking uke, and shows good craftsmanship and playability to match. The Dolphin comes equipped with a pickup and – on most marketplaces – Luna’s UK-T2 preamp, which features a volume control, and sliders for bass and treble, as well as a built-in tuner. It’s not the most versatile system in this price range, but it works well enough. On the Luna-branded headstock, you’ll find a set of open-geared tuners with attractive pearloid buttons, which are stable and responsive. It also comes with a rosewood bridge, graphite nut and saddle, Aquila Nylgut strings, and a gig bag, which is no less than you’d expect at this price. Thankfully the sound is great, and matches the vibrant design. The all-maple construction is to thank for the bright, crisp tone, although it’s nicely rounded and not overly harsh. There’s ample projection acoustically, while plugged into an amp via the ¼” output jack, the sound is clear and amplified quite naturally. It’s safe to say that we love the design and feel of this ukulele. While some of the woods on the ukes in this price range are lovely to look at with a natural finish, there’s something very alluring about the oceanic theme of the Dolphin. The decent hardware and bright sound also impress, and certainly make this sub-$300 uke feel worth the cash. Some Luna models can be hit or miss in their overall look, sound and feel – this one is definitely a hit! 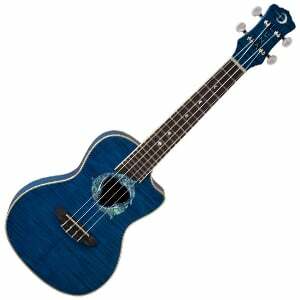 For more info about the Luna Dolphin Concert Ukulele, click here. For more Ukulele Under $300 you might like, click here.